News that a new adaptation of Poldark - featuring Robin Ellis in the role of Reverend Halse - will be coming to Masterpiece this year, had an Afternoon Tea fan wanting to know what the lovely "Demelza" played by Angharad Rees, has been up to. 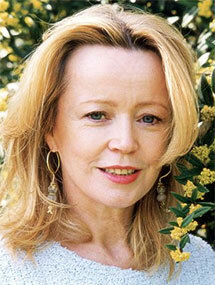 It saddens me to report that the Welsh actress died in July of 2012 at the age of 63, from pancreatic cancer. The curly-haired redhead played Demelza from 1975 to 1977 and I was surprised to learn that less than a decade before she had worked as an assistant stage manager and actor at The West Cliff Theatre, just down the street from my parent’s home in Clacton-on-Sea. Not long after, in 1968, she made her television debut as the parlourmaid in a BBC television adaptation of George Bernard Shaw's Man and Superman, which also starred Maggie Smith. That was the first of many television roles for the Welsh actress. Her film roles were few and far between; the most notable being that of Gossamer Beynon in Under Milk Wood, which also starred Richard Burton, Elizabeth Taylor and Peter O'Toole. Reese worked again with Burton in the 1974 mini-series, The Gathering Storm; Burton played Winston Churchill, Rees played his daughter. Rees as Demelza with Robin Ellis as Ross Poldark. In 1973, Rees married actor Christopher Cazenove, who you might recall from Masterpiece Theatre’s The Duchess of Duke Street and Dynasty. The couple had two sons; sadly the eldest died in a car accident in 1999 at the age of just 26. 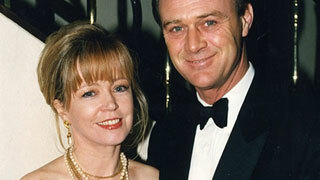 Rees and Cazenove divorced in 1994, but remained close until Cazenove’s death in 2010 from septicemia. Despite having enjoyed a successful career as a stage actress, Rees gave up acting to focus on developing her own Knighstbridge-based jewelry design business. 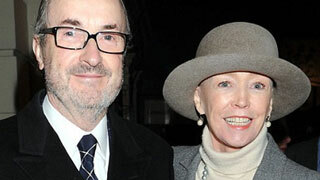 In 2005, she became Lady McAlpine, when she married Sir David McAlpine, a member of the McAlpine construction empire. Already suffering from the effects of the cancer that was to take her life, the wedding took place at The Royal Hospital Chelsea, London. Rees with first husband Christopher Cazenove. Rees’s memorial service was attended by a wide assortment of dignitaries and celebrities ranging from members of the Royal Family to 1960s pop star Lulu. Downton Abbey creator, Julian Fellowes, was also there and in his address to the congregation he spoke of Rees’s fierce personality. “She was a fighter,” Lord Fellowes told the congregation. “Not for nothing was her nickname 'hand-grenade’.” Fellowes then went onto explain how he had only four big arguments in his life and two were with Rees.